Tag line: "Lose Yourself in a Good Book"
Normally, by the time a movie is over, I have a fairly good idea of whether it worked for me or not, but when the final credits rolled on 1989’s I, Madman, I admit I was stumped; there were things I definitely liked about the movie, yet some elements were so bad that I couldn’t possibly justify them. So, after turning it over and over in my head, I came to the following conclusion: I’m not sorry I watched I, Madman, but I can’t, in good conscience, recommend it to others. Virginia (Jenny Wright), a part-time actress who works at a second-hand bookstore, loves reading horror novels, and has been trying to track down a copy of I, Madman, a book written by her new favorite author, Malcolm Brand. One evening, she finds the book sitting at the front door of her apartment, though she has no idea who left it there. Her boyfriend, Richard (Clayton Rphner), a police detective, tries to get Virginia (who scares very easily) to stop reading these “trashy” novels, yet despite his warnings, she can’t put I, Madman down, and carries it with her everywhere she goes. But when a mysterious killer with a deformed face (Randall William Cook), who bears a strong resemblance to a character in I, Madman, mistakes Virginia for his estranged lover, it leads to a murder spree that baffles the police, and has Virginia running for her life. I had several issues with I, Madman, starting with a rather unfortunate bit of stop-motion animation, which is featured in the opening sequence. I won’t get into specifics, because this scene has its moments, but I was taken out of it completely the second the stop-motion came into play. Still, this is a minor quibble (and, to be honest, the animation, while not good, wasn’t the worst I’d ever seen). The film’s portrayal of a police precinct, populated by detectives who barely look the part, is yet another of I, Madman’s failings, but the movie’s biggest problem, and the one that ultimately dooms it to mediocrity, is the performance of Jenny Wright, who’s incredibly bland and lifeless as the heroine, Virginia. 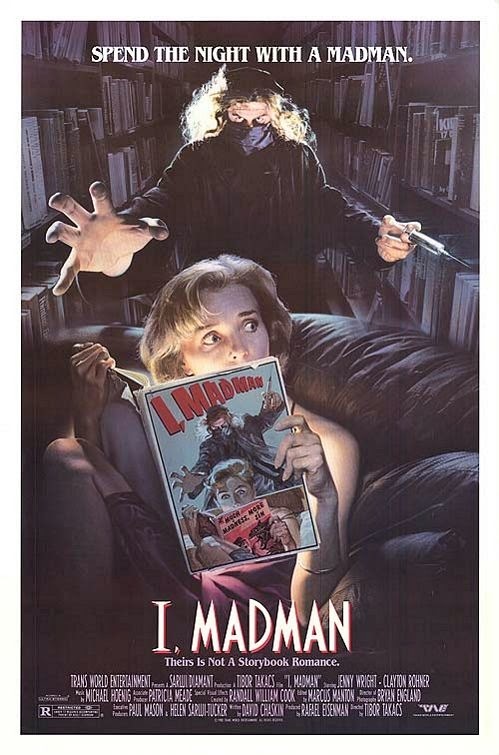 There wasn’t a single scene in I, Madman where I was convinced she was scared, and she’s even less believable later in the film when her character is in full detective mode, trying to figure out where the killer will strike next. Personally, I don’t think Ms. Wright was leading lady material; she had very minor roles in Pink Floyd the Wall and The World According to Garp, and did a fine job in both those movies. As the focal point of I, Madman, Ms. Wright gives off a distinct “deer in the headlights” vibe, as if she knew she was in way over her head. It’s a shame, too, when you consider how strong Randall William Cook is as the movie’s villain. Hidden behind layers of make-up (which also looks pretty damn good), Cook gives you the creeps every time he sneaks out of the shadows, whether he reveals his hideous deformity or not, and even though I found his character somewhat repulsive (which was obviously the point), the movie’s energy level spikes whenever he’s on-screen. It was Cook’s performance, as well as his character’s back story (he sliced his face to shreds, and is using the body parts of his victims to try and reconstruct it), that impressed me the most. Unfortunately, Mr. Cook isn’t around nearly as much as Ms. Wright, and as a result, I, Madman never reaches the heights it might have had another actress played the lead.